This project rose from the ashes of a fire that severely damaged a fourplex apartment building built in 1912 in the popular Lake of the Isles neighborhood of Minneapolis. A total renovation transformed the historic fourplex into two distinctive 3,100 square foot, three story side by side luxury condominiums. 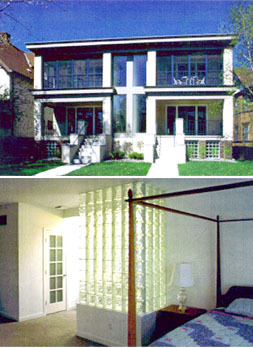 The contemporary loft-style homes were custom designed for each buyer and combine the old-world charm of large windows and hardwood floors with open floor plans and all new systems to create two truly unique homes.